Australian director Cate Shortland has been in no hurry to follow up her award-winning 2004 feature debut Somersault and she takes her time, too, with the German-language Lore, unspooling a lyrical, deeply affecting study into a rarely seen legacy of the Holocaust. Cate Shortland’s second feature was not at Cannes this year. Her debut, Somersault, had premiered there in Un Certain Regard, back in 2004; this one had been tipped for selection, perhaps even in Competition. Its omission now seems especially curious, given both the lack of female filmmakers in this year’s lineup (the official reason: none had films ready to submit), and the extraordinary achievement it represents. This gripping off-road movie is Australian director/co-writer Shortland’s first feature since her debut success, Somersault (Cannes, 2004). 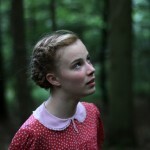 In competition at the Sydney Film Festival, Lore is entirely in German with English subtitles, but that hasn’t slowed pre-world-premiere international interest. Due for local release here late in the year, it’s a certainly for multiple festival outings, and a very good bet for local and international directing, technical and acting awards. I’m absolutely thrilled to be hosting tomorrow’s Sydney Film Festival Apple Store talk with Cate Shortland.